Breitbart Editor-in-Chief Alex Marlow was in his home office last Tuesday night running the front page of the far-right website when he learned that Judge Roy Moore would not be elected as the next senator from Alabama. He was, he says now, not shocked by the news. In the days leading up to the election, it had at times been difficult to distinguish the front page of Breitbart from a Moore campaign website. Breitbart hyped polls favorable to Moore, attacked his critics, and boosted stories calling on individuals to get out to vote. As one Breitbart staffer told CNN, "It seemed at times we were an arm of the Moore campaign." Indeed, internally, Matthew Boyle, the website's Washington editor, told staffers that the "only big story" was the race. "It's literally everything," Boyle wrote in the company's Slack group, calling for an "all hands on deck" approach and saying it would decide the "future of the economic nationalist movement and whether Trump is going to win." But speaking to CNN in a recent phone interview, Marlow took a starkly different tone. He described Moore as a "weak candidate" who "ran a terrible campaign" -- sentiments that Breitbart hadn't clued its readers into as it was serving as a de facto mouthpiece for the judge. Marlow said those factors, accompanied by a sexual misconduct scandal that raged on for weeks, and what Marlow contends was a biased news media, kept his expectations in check. At the end of the race, he said, he anticipated it being close. "I wasn't actually as shocked as people would think," Marlow said about what ended up as a Democratic upset in deep red Alabama. "It made a lot of sense to me." Marlow said he had no regrets about Breitbart's coverage of the race and stressed that the nationalist, populist website will not be changing course as a result of it. In fact, Marlow told CNN, he believes that "in hindsight a lot of people are going to give us credit" for how Breitbart covered the election, characterizing its approach as "very brave" and "very bold." 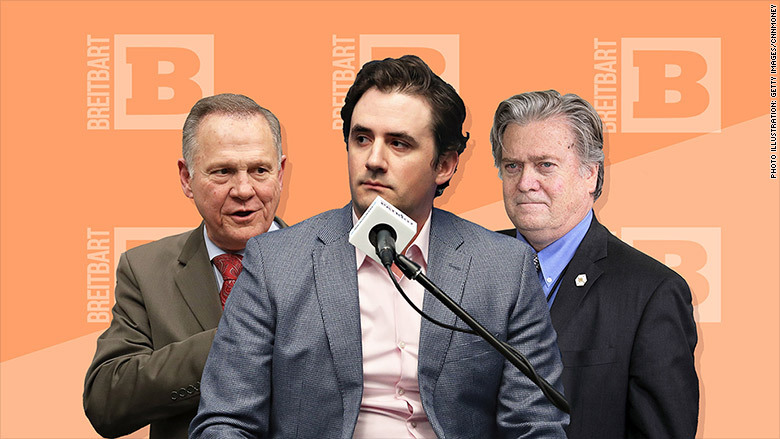 Breitbart had poured resources into Alabama. In mid-September, during the heated Republican primary, Breitbart executive chairman and former White House chief strategist Steve Bannon ordered top editors at Breitbart to step up the website's overwhelmingly negative coverage of Luther Strange, the candidate who President Trump and Senate Majority Leader Mitch McConnell had chosen to back. Bannon and other Breitbart personalities, such as former White House aide Sebastian Gorka, also visited the state to campaign for the controversial judge. The primary became an inflection point between the nationalist, populist forces on the right, led by Bannon, and the more traditional, establishment wing of the Republican Party, led by McConnell. In the end, Bannon came out victorious, though experts have suggested he did not play the deciding role that has at times been attributed to him. Then The Washington Post rocked the race with a bombshell story in which four women said Moore made inappropriate sexual advances on them while they were teenagers. The report, and stories that emerged in the days that followed, prompted prominent individuals on the right to distance themselves from Moore. But Breitbart remained loyal. The website scooped The Post on its explosive first story about the sexual misconduct allegations against Moore, saying it was about to be published and framing it as a political hit job from a supposedly leftist newspaper. And despite Bannon at one point asking confidants about whether he should continue supporting the embattled candidate, as CNN has previously reported, he ultimately decided to continue backing Moore. Until Election Day, Breitbart seemingly did everything in its power to try to discredit Moore's accusers. Marlow said one of the factors in Breitbart's coverage of the allegations against Moore is that, he believes, the news media was trying to use them to set a bar on sexual misconduct "that President Trump cannot match." "I think they want to create a standard where President Trump either from past or future accusations, will not be able to match whatever standard is now in place for who can be a United States senator," he said. "Based off not any sort of conviction or any sort of admission of guilt, but based off of purely allegations." "I think that's the playbook here," he added. "And I think it's part of the reason why it was so important for Breitbart to continue our coverage of the way we covered it ... and for Steve in particular to hold the line the way he did for -- I think part of it is because it's not just about Judge Moore, it is not even just about establishment, anti-establishment. It's about what's coming next for President Trump." Though Marlow concedes that Breitbart made coverage decisions around protecting Trump, before the sexual misconduct allegations against Moore, Breitbart had been hammering the news media and Hollywood for supposedly protecting individuals like Harvey Weinstein. Asked about the view from critics that Breitbart had done exactly that with Moore, Marlow claimed the website has been "much more careful" than other outlets when covering ongoing allegations of sexual harassment and assault, saying the website looks for "certain factors," such as "a certain level of detail" in allegations. Marlow also stressed that he was personally uncomfortable with the behavior attributed by The Post to Moore, and noted that he did believe the accusations from Leigh Corfman, who said Moore assaulted her while she was 14 -- they were "not perfect," he said, but had "a lot of credibility." He also noted that he, and much of the Breitbart audience, initially supported Mo Brooks in the Republican primary, and only shifted support to Moore because of his opposition to Strange as the establishment candidate. But he said he saw political motivations behind The Post's reporting on Moore and wanted to home in on the "coverage of the coverage." "Why The Washington Post chose to lump in a bunch of far, far, far lesser accusations immediately rose my suspicion that they were trying to set narrative more than they were just trying to report the story," he said. Unfortunately for Moore, Breitbart's microphone alone wasn't enough to sway enough voters to cast their ballots for him. And when he lost, the knives came out for Bannon and the website he leads. Steve Holmes, former chief of staff to McConnell, said in a statement that Democratic Senate Minority Leader Chuck Schumer should put Bannon and Breitbart "on payroll." Rep. Peter King said Bannon looked "like some disheveled drunk who wandered onto the national stage." And conservative news heavyweight Matt Drudge put Bannon on blast with a banner on his highly-trafficked website reading, "BANNON BUSTED." Marlow declined to comment on Drudge's attacks ("This is a game I'm not going to play where I am commenting on what Drudge does or why he doesn't," he said. ), but addressing the criticism at large, Marlow said he felt Moore was "a uniquely terrible candidate" and that people were trying to extrapolate too much from one race. "I still think that it is quite evident that Bannon and Breitbart are the most feared names in politics," he said. "And you can see it by the meltdown that so many people are having. The joy, the elation, the perception that Breitbart lost." "The perception that this is such a blow is very complimentary in a way," Marlow added. "People are so desirous to undermine our power. I think this builds us up. I think this builds up Steve's brand. I think it builds up Breitbart's brand. Because people want honey badgers. People want fighters." Update: This article has been updated to add that Marlow initially supported Mo Brooks in the Republican primary.